Lights Out – Guest post by Steve McIntyre | Watts Up With That? upstairs, was immoderate. It was not ad hominem, though. other aspects of the letter. some down (over U.S. only). was not required because of version unavailability. sets. Just stick with the data set that they started with. the 1930s and the warmest year was 1934.
mean temperatures is a few hundredths of a degree. 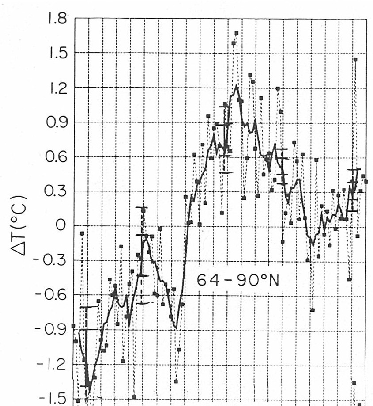 relationship between 1934 and 1998.
estimates have been reduced by approximately 0.4 deg C.
I have a question about the NASA site. On the http://nasadaacs.eos.nasa.gov/articles/2006/2006_seaice.html page it shows a graph for summer melting here http://nasadaacs.eos.nasa.gov/articles/images/2006_seaice_graph.gif But that graph only shows the bottom half of the data. It you go to another site here http://nsidc.org/seaice/characteristics/difference.html the graph for Arctic Ice from the University of Colorado list data for both the melting and the maximum. They appear to show no significant change in their data. If you took the mean of that graph it would be close to zero. Can anyone explain this to me? Good post and thanks for cross-posting it here. Steve does a good job disecting Hansens’s letter, but you really have to read it to believe it. Regarding Hansen’s statement, “My apologies if the quick response that I sent to Andy Revkin and several other journalists, including the suggestion that it was a tempest inside somebody’s teapot dome…” seems to be a pretty clear shot at President Bush as the “Teapot Dome” scandal was on the verge of bringing down President Harding who ultimately died in office in the 1920s. Hansen has publicly ripped the head of NASA and Bush in the past. Doesn’t seem like a guy with any concerns about job security. If nothing else, this entire episode should make it more difficult for GISS, NCDC, IPCC and the rest to continue with the “trust us” routine. Regardless of which side of the issue you are on, that is good for science. Some await the apocalypse; others think the problem will be merely annoying. In any case, the federal government’s own outlook inspires little confidence. Joel Willemssen of the U.S. General Accounting Office doesn’t sugarcoat his answer. “All the government agencies will not be done on time. There will be some failures,” he says. Jim Hansen has made Joel Willemsson into a modern day Nostradamus. That is truly an impressive compilation of GHCN data on a station by station basis. I know it will be usefull in the work being done. Thank you for the hard work to make it available. Sinan, be sure to archive old versions of the data, in case of future retroactive adjustments. Thanks for the comments. My web site is basically read-only at this point. In any case, I am hoping that what I am doing can complement Steve and Anthony’s work in some way. The graphs that are currently on my site are useful because they show, for each location, the maximal amount of data available. It is interesting to note that, while the U.S. is a small part of the global surface area, many of the longer, continuously updated temperature series come from the U.S. I plan to go over my scripts and release them this week. Sinan that is awesome. I would have had no idea how spotty the world record is without looking at your graphs. Another thing your presentation pointed out to me is the contrived nature of using temperature extremes to plot changes in the global temperature. That was below my radar, and I thank you for pointing it out to me. Perhaps surfacestations.org should have a link to the graph on Sinan’s site for each station? I know it would be some extra work, especially retro-adding it to the site pages already online, but if it was included as each site was uploaded it would make things much easier. The raw data must always be available. Correction factors are just guesses. Molon Labe: Thank you for the correction. I will fix the template and regenerate the HTML pages. There are a couple of other changes I want to make to the presentation and I will post a note here when the new version is up. The whole shebang consists of 13,000 files and just generating and uploading them takes some time. I prefer generating the information offline and serving static content. I have to admit. I still don’t fully understand these databases. Why does the series for Copenhagen, DK end in 1991? How can I find out where NOAA or other “official weather stations” are located in Central Florida? Anyone know? 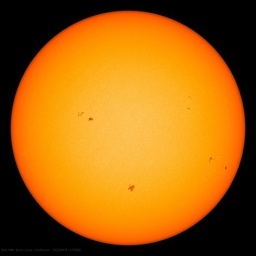 See http://www.surfacestations.org which is my nationwide project to locate and document such stations. There is a master list link on the front page that has info on station locations. There is also a browsable online database of photos acquired already.